Point Pleasant freshman Tanner Mitchell goes to apply a tag to Gallia Academy’s John Stout during a steal attempt at third base on Tuesday night in a non-conference baseball game at Bob Eastman Field in Centenary, Ohio. Point Pleasant freshman reliever Joel Beattie (12) relays a throw to first base during the sixth inning of Tuesday night’s non-conference baseball game against Gallia Academy at Bob Eastman Field in Centenary, Ohio. CENTENARY, Ohio — In the end, it came down to making the most of opportunities. 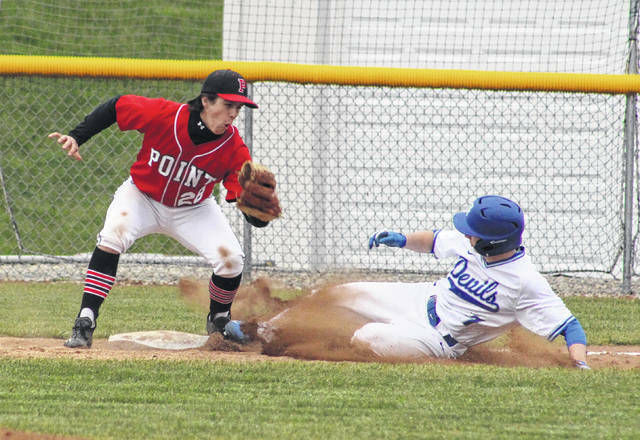 The Point Pleasant baseball team had seven extra baserunners over the course of six innings, and those numbers eventually added up late during an 11-9 victory over host Gallia Academy on Tuesday night during a non-conference cotest at Bob Eastman Field in Gallia County. The Big Blacks (5-4) found themselves in a 3-0 hole after an inning of play, but the guests rallied to score eight of the next nine runs en route to building an 8-4 cushion midway through the fourth. The Blue Devils (3-3), however, answered with a five-run outburst during their half of the fourth, allowing the Blue and White to recapture the lead at 9-8. Gallia Academy mustered only one baserunner over the final two innings, while the Red and Black managed to tie things in the top half of the fifth as Brody Jeffers hit a sacrifice fly to right that allowed Miles Williams to score for a nine-all contest through five complete. Then, in the top of the sixth, Williams received a bases-loaded walk with two away — which forced home Sam Pinkerton with the eventual game-winning run. Carter Smith scored a handful of pitches later after a wild pitch allowed Point to secure a two-run edge headed into the finale. The Blue Devils went down in order in the bottom half of the sixth, and the game was ultimately called at that point due to darkness. 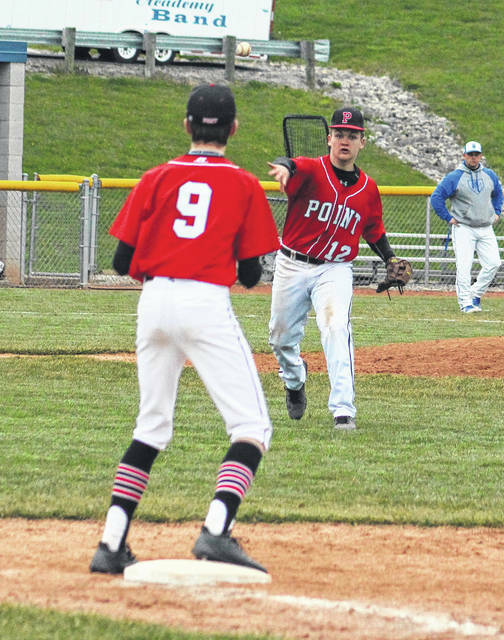 Point Pleasant secured its second straight victory overall while also avenging a 9-6 setback to Gallia Academy at home back on March 26. The Big Blacks outhit the hosts by an 11-5 overall margin, but they also committed the only three errors in the contest. The guests stranded 11 runners on base, while the Blue Devils left six on the bags. Given the adversity within the game and the emotion of playing a cross-river rival, PPHS coach Andrew Blain was pleased with final outcome — particularly with three more games slated on the schedule this week. “It’s good to see some resiliency out of this group. We’ve had to battle a little adversity in our last few games, but we found ways to battle back and get some momentum going,” Blain said. “We are starting to show some signs of growth in our last few games, plus it’s always a positive to come to Gallia (Academy) and pick up a win. In contrast, GAHS coach Rich Corvin was disappointed with his team’s offensive production — mainly because five of the six Blue Devil baserunners were in scoring position when they were left on base. The Blue Devils went on the offensive early as the hosts benefited from two errors, two hits and a wild pitch en route to building a 3-0 advantage. John Stout led the bottom of the first off by reaching on an error and later scored on a one-out error that allowed Garrett McGuire to reach safely. Josh Faro and Dylan Smith had back-to-back singles to load the bases, then Morgan Stanley drew a two-out walk that forced in McGuire for a 2-0 advantage. Faro scored on the next pitch as a wild pitch gave the hosts a three-run cushion after one full frame. Point Pleasant answered in the top half of the second by sending nine batters to the plate, which yielded three runs on two hits, two walks and two hit batters. Joel Beattie scored the first run after a bases-loaded walk to Pinkerton, then Kyelar Morrow came in for a 3-2 contest as Carter Smith was hit by a pitch. Alec Smith followed with a single that plated Tanner Mitchell, tying the game at three after an inning and a half of work. Gallia Academy recaptured the lead in the second after McGuire hit a sacrifice fly to left that allowed Andrew Toler to score for a 4-3 lead after two complete. The Big Blacks captured their first lead of the night in the top of the third after scoring a pair of runs for a 5-4 edge. Pinkerton singled home Jeffers for a four-all contest, then Carter Smith grounded into a fielder’s choice that allowed Beattie to score. PPHS added to its lead in the fourth as back-to-back singles by Williams and Tucker Mayes led to scores. Williams came home on a sacrifice fly by Jeffers, then Mayes ended up crossing home plate on a passed ball that gave the guests a 7-4 lead. Pinkerton later delivered a two-out single that plated Morrow, allowing the guests to build an 8-4 advantage midway through four frames. Gallia Academy retaliated by plating four runs in the home half of the fourth, all of which came with two outs in the inning. Stout scored on an error that allowed Faro to reach safely, then Dylan Smith singled in McGuire for an 8-6 contest. Morgan Stanley later drove in both Smith and Brendan Carter with a single to centerfield, tying the game at eight-all headed into the fifth. Both teams used three hurlers apiece in the contest. Beattie picked up the win after working two perfect innings of relief while striking out two. Toler suffered the setback after surrendering seven earned runs, nine hits and four walks over 3⅓ innings while fanning one. Williams, Beattie, Morrow and Pinkerton led Point Pleasant with two hits apiece, followed by Mitchell, Alec Smith and Tucker Mayes with a safety apiece. Pinkerton led the guests with three RBIs, while Jeffers and Carter Smith each drove in two runs. Dylan Smith paced GAHS with two hits, followed by Simms, Faro and Stanley with a safety apiece. Stanley drove in a game-high three RBIs in the setback.